Chocolate on Valentines Day is a must! -In any type of way. Normally I’m not to fussed about chocolate, but when it comes to chocolate truffles with chili I just can’t stop eating! They are sooo good! Perfect ending for your Valentines Dinner. In a casserole, pour the cream, some honey and the ginger and cayenne pepper. Bring it up to boil and take it off the heat. Break the chocolate into little pieces and put it in the warm milk. Stir with a wooden spoon until you have reached a smooth silky texture. Pour the mixture on a tray and let it cool for a couple of hours. 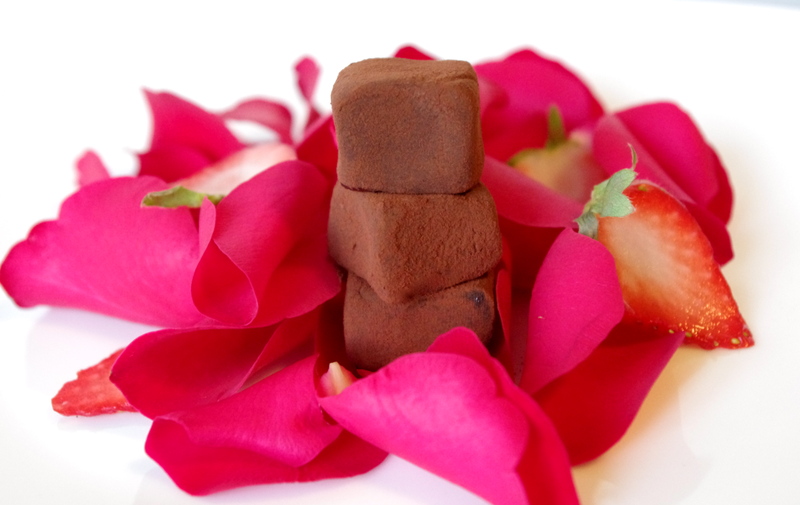 Cut the truffle in little cubes and cover each truffle with cocoa powder.